Power Surge Short term high voltage With voltages above 110% of nominal, surges can be triggered by a rapid reduction in power loads, heavy equipment being turned off, or by utility switching. The results can potentially damage hardware. Reduced line voltage for extended periods of a few minutes to a few days Can be caused by an intentional utility voltage reduction to conserve power during peak demand periods or other heavy loads that exceed supply capacity. Electrical Line Noise High frequency waveform that piggyback on the line waveform Can be caused by either RFI or EMI interference generated by transmitters, welding devices, SCR driven printers, lightning etc. High Voltage Spike Instant and dramatic increase in line voltage Can be caused by lightning strike and can send line voltages to levels in excess of 6,000 volts. A spike almost always results in data loss or hardware damage. Frequency Variation A change in frequence stability Resulting from generator or small cogeneration sites being loaded and unloaded. 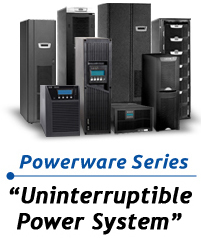 Frequency variation can cause erratic operation, data loss, system crashes and equipment damage. Switching Transients Instantaneous high voltage increase Normal duration is shorter than a spike and generally falls in the range of nanoseconds. Harmonic Distortion Distortion of the normal waveform generally transmitted by nonlinear loads Switched mode power supplies, variable speed motors and drives, copiers and fax machines are examples of non-linear loads. Can cause communication errors, overheating and hardware damage.